At DropBox Inc. we are the most experienced shipping container modification company in the United States, and we take your shipping container modification projects to the next level. The products we provide are turn-key, portable, and ready to deliver for use within a short amount time upon arrival to your location. 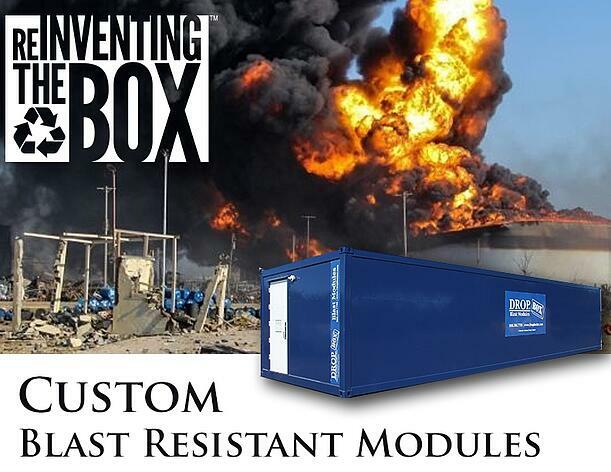 Our Blast Resistant Modules (BRM) are built using all-steel ISO shipping containers and/or steel kits as their base and are constructed to perform when and where you need them. For use in power plants, refineries, chemical plants, and more, our BRMs are developed through years of experience in ISO shipping container modifications. Over the years DropBox Inc. has closed the gap with major competitors in the industry by providing its brand of portable flat-sided BRMs that can be used as break rooms, meeting spaces, and equipment storage for customers all around the world. 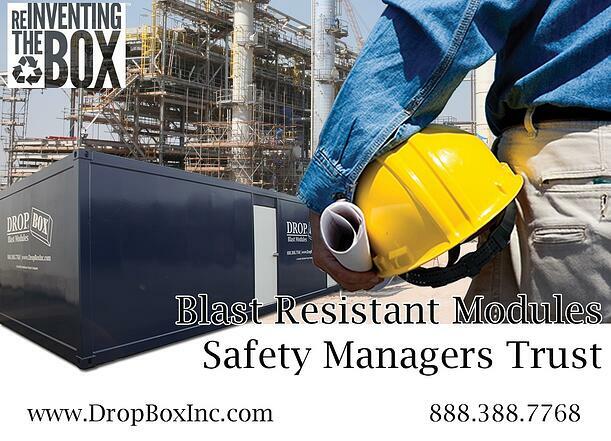 Make sure your employees and contractors stay safe and productive in the blast zone with a Blast Resistant Module (BRM) from DropBox Inc.
DropBox, Inc. is a container modification company that provides both standard containerized products and custom builds for shipment worldwide. Standard products include but are not limited to Sanitation Stations (Commercial Quality Running Water Restrooms), Shower Trailers, DropOffice™ (Mobile Office), Mobile Tool Cribs, Decontamination Stations, Chemical Storage Units, High Security Storage, Wet & Dry CHU's, Laundry Units, and Blast Resistant Modules. The DropBox Design Team can modify any of our current products or start from scratch to meet your specific requirements. The custom options are limited only by your imagination and the total interior square footage of the chosen layout. At DropBox Inc., we pride ourselves on providing excellent, comprehensive customer service with an in-house team of engineers, CAD draftsmen, and designers to ensure you get the Blast Resistant Module (BRM) you need regardless of the job site, climate, and footprint available. We offer a wide range of floor plans and can ship to anywhere in the United States from any of our three locations: Worthington, KY, Wurtland, KY, and Sulfur, LA. In this featured video we hope to illustrate our capabilities and encourage you to contact DropBox Inc. as your reliable source for safety on your job site. 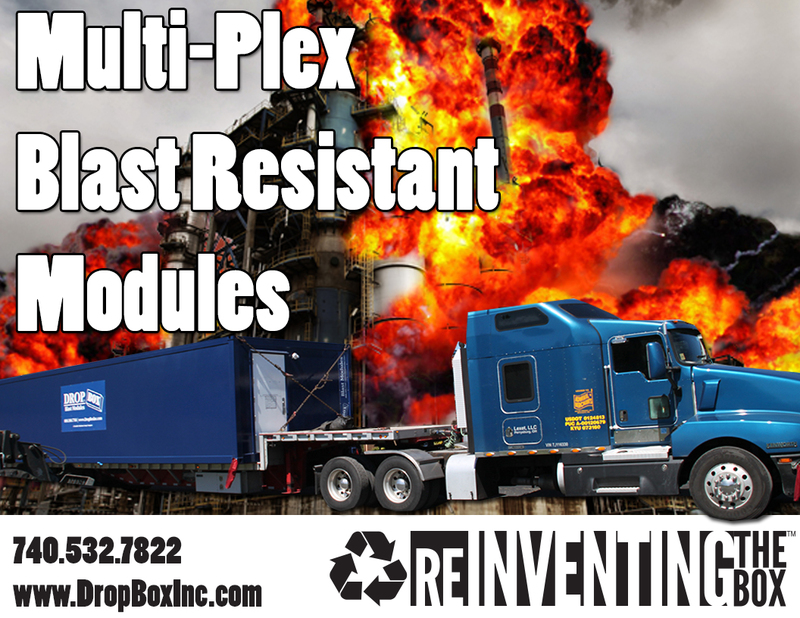 For more information about DropBox Inc. and all of our blast resistant modules CONTACT US HERE or call us toll free at 888.388.7768. DropBox, Inc. provides blast resistant modules (BRM) that safety managers have come to trust in petrochemical, energy, and refining facilities around the United States. Our custom BRMs are the safe solution for inherently dangerous locations in blast zones 1, 2, and 3. The blast resistant modules provided by DropBox Inc. are the perfect solution for break/lunch rooms, ground-level offices, tool cribs, storage facilities, and multipurpose buildings. We can provide standard 12' wide and custom size blast resistant buildings from 1 to 8 and even 10 PSI that come in a variety of sizes and configurations based on your site-specific needs. Our standard sized BRMs are 12′ x 40′ with an open floor plan that give an added level of flexibility to any jobsite or project in the blast zone. In addition to ground level blast resistant modules, our standard units can be stacked to further maximize the use of space given by your footprint. At DropBox Inc., we pride ourselves on providing excellent, comprehensive customer service with an in-house team of engineers, CAD draftsmen, and designers to ensure you get the BRM you need regardless of the jobsite, climate, and footprint available. We offer a wide range of floor plans and can ship to anywhere in the United States from any of our three locations: Worthington, KY, Wurtland, KY, and Sulfur, LA. Our products meet API RP 753 guidelines and are designed to maximize safety. Do you have an outage, turnaround or expansion coming up? If so, turn to the company safety managers around the world are relying on and be prepared. Keep your contractors and employees productive and safe on the job site with blast resistant modules from DropBox Inc. for temporary or permanent modular units in zones 1, 2, and 3. DropBox Inc. engineers, designs, and builds custom blast resistant modules for customers around the world. Commonly called the "BRM", these shelters that are used for tool cribs, offices, break rooms, and meeting spaces are built to withstand the dynamic and concussive forces of explosions that are an inherent risk in refineries and petrochemical facilities. The extreme heat, flames, smoke, excessive noise levels, and the blunt force of projectiles in the event of an explosion within industrial facilities can pose great risk to the health and lives of workers. The custom BRM units that DropBox Inc. provides are designed to resist the dangers of an explosion and save lives when and where it matters most. With an in-house team of engineers and CAD draftsmen, DropBox Inc. can carefully analyze your site-specific needs to develop a blast resistant module that not only provides the break room, tool storage, and meeting space you need, but also has the potential to save the lives of employees in the event of an explosion. 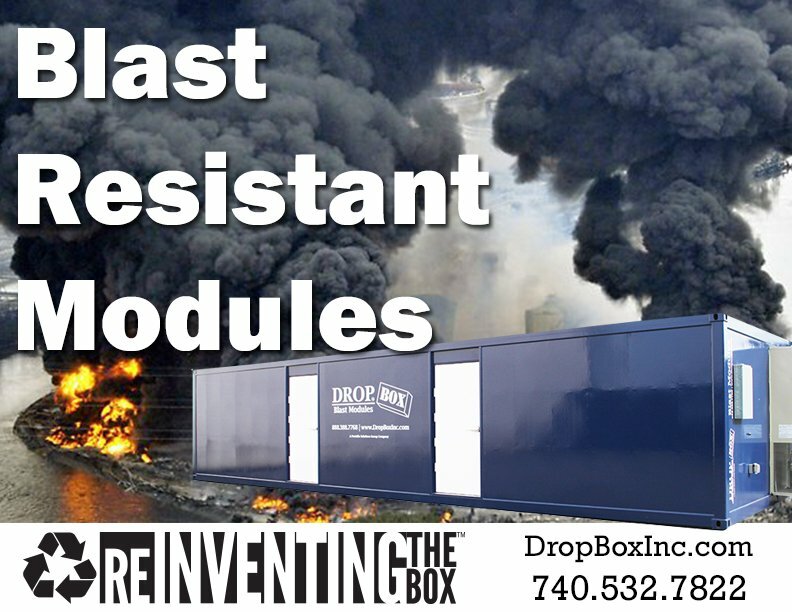 DropBox Inc. can ensure that the Blast Resistant Module you get from us is fully engineered, designed, and built to meet your exact specifications. While DropBox Inc. offers a standard line of 12' wide and 20' or 40' long blast resistant modules, we also have the in-house expertise to custom engineer, design, and build other floor plans to meet your spatial requirements. We offer multi-plex and stackable BRM units in addition to our standard models. Need something more than a meeting/break space? Look no further than DropBox Inc., as we have built custom blast resistant modules that house chemical labs, restrooms and showers, as well as kitchen spaces. Additional features of the DropBox Inc. Blast Resistant Modules may also include recessed exterior equipment housing, interior and exterior lighting, power distribution, raised flooring, pressurization, combustible gas detection, and fire suppression equipment that will make your BRM suitable for any application. To download a product brochure of our Blast Resistant Modules CLICK HERE and CONTACT US with any questions.